It is surprising to discover from Stephen’s speech in the New Testament that Abraham never received the land promise from God! Did Abraham Expect to Receive the Promise in the Future? Notice carefully what we are told: Abraham lived in the promised land in a tent – “tabernacles”, as a stranger. He died without receiving his inheritance, looking for a “city which hath foundations, whose builder and maker is God”. He was looking for a “heavenly” country. 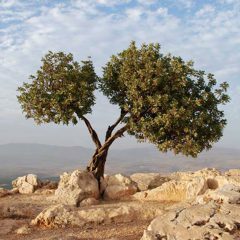 Did Abraham Expect to Receive the Promise Himself? Sometimes it can be helpful to look at the original Greek words that are used in confusing passages. Our favourite computer Bible program is PowerBible, which makes it really easy to research the meanings and usage of all the original words in the entire Bible. In the box below you can see what the Interlinear version looks like on PowerBible, showing all the Greek words in ‘< >’ as they relate to the English translation of Hebrews 11. 10 For <gar> he looked for <ekdechomai> a city <polis> which hath <echo> foundations <themelios>, whose <hos> builder <technites> and <kai> maker <demiourgos> is God <theos>… 13 These <houtos> all <pas> died <apothnesko> in <kata> faith <pistes>, not <me> having received <lambano> the promises <epaggelia>, but <alla> having seen <eido> them <autos> afar off <porrhothen>, and <kai> were persuaded of <peitho> them, and <kai> embraced <aspazomai> them, and <kai> confessed <homologeo> that <hoti> they were <eisi> strangers <xenos> and <kai> pilgrims <parepidemos> on <epi> the earth <ge>. 14 For <gar> they that say <lego> such things <toioutos> declare plainly <emphanizo> that <hoti> they seek <epizeteo> a country <patris>. 2310. yemeliov themelios, them-el’-ee-os “2310” – Strong’s concordance number. “themelios” is the Greek word. something put down, Actual definition of <themelios>. i.e. a substruction (of a building, etc. ), (literally or figuratively): Strong’s ideas about what the word means. –foundation. Anything after the “–” lists all English words used for ‘themelios’ in the KJV. See Greek 5087 (tithemi) A place to click on the root word. This is the new Jerusalem – the city that God has promised for the future! Just like them – we are looking for this heavenly city! So, all this begs the question, When and where will everyone receive the promises? Remember Jesus is the primary offspring inheriting the promises. And if we are baptized into Christ – we will inherit them as well (Galatians 3). Where is this “heavenly” city that we are all seeking? Will it be in heaven, since it is termed a “heavenly” city? Or is the Promised land, where Abraham, Isaac and Jacob lived in as strangers – the land of “Israel” today – going to be made a “heavenly” city? Could it be that this city is termed “heavenly” because it will no longer be ruled and fought over by earthly humans? In our next blog we will consider other passages that refer to the “Kingdom of God” and the time of peace and happiness promised when Jesus reigns as King. We need to determine whether God’s paradise will be in heaven, or on earth. This is a really exciting study, as it frames our hope for the future and gives us a beautiful vision. If you just can’t wait for the answers, print out the Discovery Lesson and see for yourself! I think that there are four levels of land theology. 1# common (pre-Alpha, gentile, Elohistic); 2 promised alpha (geographic, Sinaitic, Yahwistic); 3# promised omega (spiritual, Yeshuic); 4# ultimate (shalom (1 Cor.15:28), universal). Abraham was a step between levels 1&2. He was pre-Israel, but knew deity above the elohom level but below the Yahweh (Gen.6:3); not having the promised land but having it promised. We in level 3 await the eschaton, when shalom shall reign. Interesting comment, but complex. If we are searching for the original Gospel message given by God, sometimes we have to strip away all the highly esteemed writings of men and just take the Scriptures at face value?